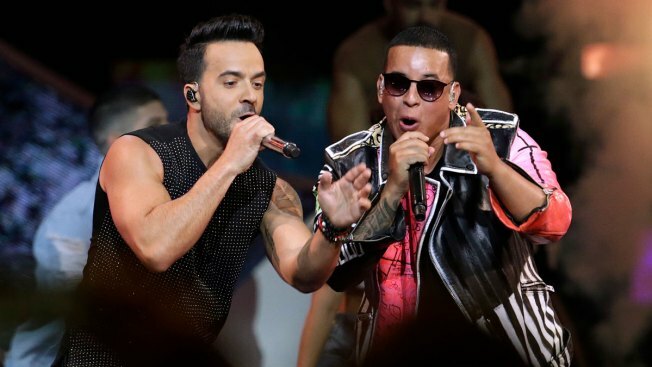 In this April 27, 2017 file photo, singers Luis Fonsi, left and Daddy Yankee perform during the Latin Billboard Awards in Coral Gables, Fla. On Friday, Aug. 4, 2017, YouTube announced that the music video for the No. 1 hit song “Despacito” has become the most viewed clip on YouTube of all-time. The music video for the No. 1 hit song "Despacito" has become the most viewed clip on YouTube of all-time. YouTube announced Friday that Luis Fonsi's ubiquitous song with Daddy Yankee hit nearly three billion views — 2,993,786,682 views to be exact — and surpassed previous record holder "See You Again," the song by Wiz Khalifa and Charlie Puth from the "Furious 7" soundtrack. "Despacito" became an international smash hit this year, topping the Billboard Hot 100 chart. The record-breaking video does not include the popular remix with Justin Bieber; that version has been viewed more than 464 million times. "Despacito" is on track to become the first video to reach three billion views on YouTube. The video is also the most "liked" video on YouTube.